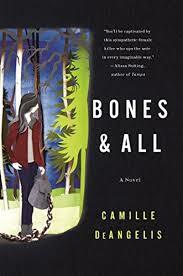 BONES & ALL is a book about a teenage runaway who is also a cannibal and she meets other cannibals and she falls in love! I don’t want to spoil anything, but reader? I cried. I’m not saying Maren is a GOOD person, but it’s not like she goes eating people like, “oh, he looks good, I’ll eat him.” So that’s something to be admired. Also Maren reads a lot so we have that in common. We could be best friends. We’d share books and I’d hold her hair back while she digested someone’s stomach. Bestie goals! When I was younger we sang this song in church called “Angels Among Us” and since I finished this book last night I’ve been singing that song with the lyrics: “I believe there are cannibals among us, NOT sent down to us from somewhere up above.” This is because I am terrible person who changes the lyrics to songs about angels to be about cannibals. I liked this book! A bunch of stars out a lot! I don’t believe in ratings systems!